We started at the Junction (naturally) to document what was there. This was one of the more delightful spots, as much of the Junction is untouched and actually opened up due to some recent brush clearing by CSX and MDOT. You can see that they have topped many of the large trees at the Junction along Talbot Ave. The Talbot Ave bridge still stands (yay!) and is open to pedestrian traffic. We managed to locate the old team track switches (wow!) still in place in the original rails. VERY cool. We walked down the Branch and found the switch lead for the E.C. Keys (now T.W. Perry) siding. Too bad they don’t still take deliveries! Here we stand at the end of the Georgetown Branch. 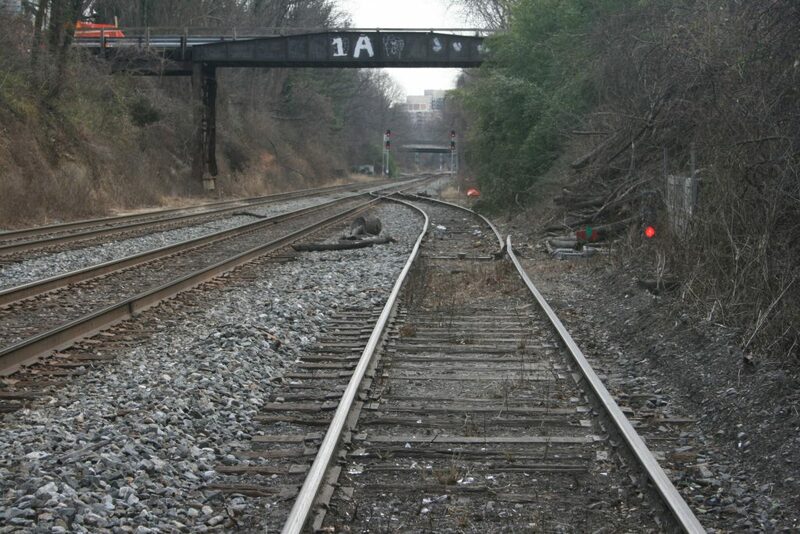 Originally, the branch extended all the way down to where the 16th St. bridge crosses in the distance. In Feb 1996 this was the site of the rail disaster where an EB commuter train collided with the WB Capitol Limited, resulting in 8 deaths and 26 injured. The lead for the GB was never rebuilt to its original length and instead was shortened to where it is now, near the Talbot Ave. bridge. 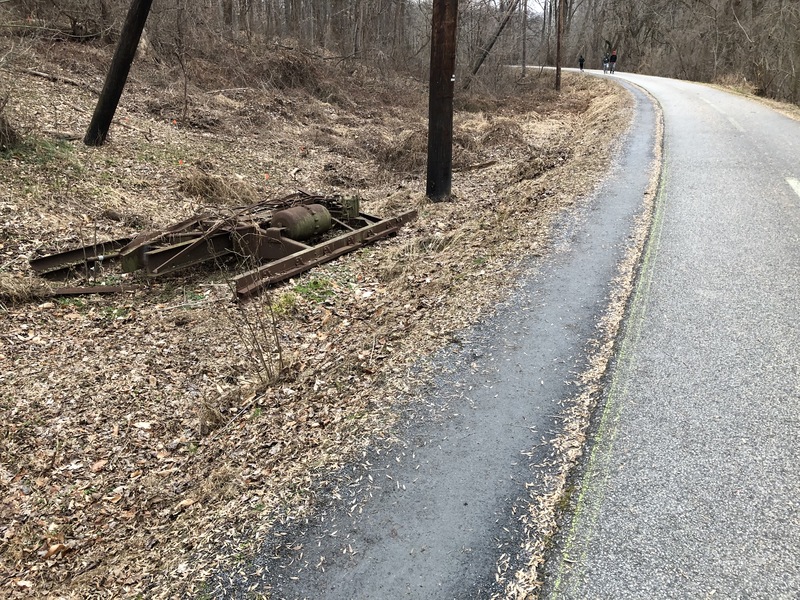 We visited several of the Branch crossings between the Junction and Rock Creek, but there just isn’t much to see besides the new Lyttonsville Rd. bridge (which had opened the day before we arrived) as well as the massive brush-clearing they have done. It was neat to see the RoW in a state closest to the original 1890’s appearance for one last time. 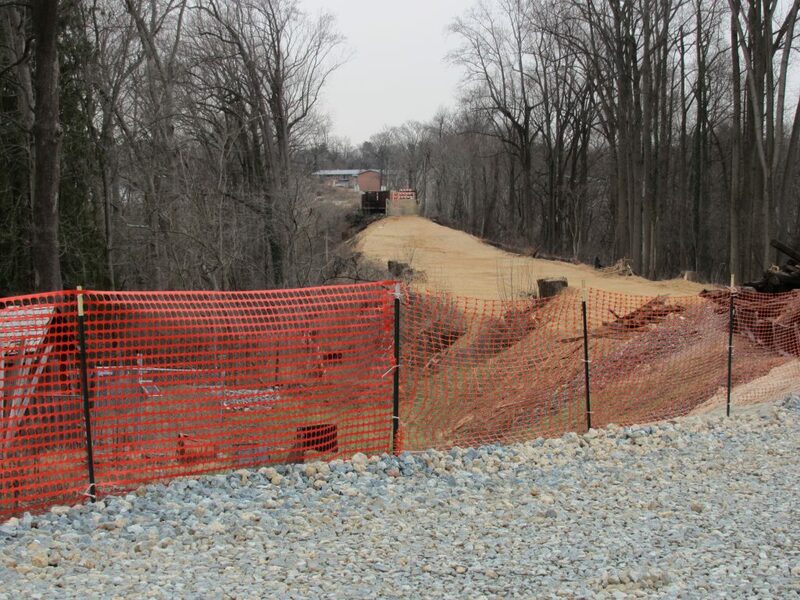 The Western approach to the Rock Creek trestle has been forever changed, as MDOT removes much of the fill to allow for the new Purple Line right of way. Here, at Rock Creek, the line will go *under* Jones Mill rd. and proceed across the Creek at a much lower level than the current trestle does. The trestle is being demolished. They have gutted the right of way. For reference, the tracks used to sit atop that concrete abutment and continued to the level I was standing on. All of the dirt you see in this picture is fresh. It’s as if they sliced the top of the fill off. And they’re just getting started. The Rock Creek trestle (in the distance) is not long for this world. It’s already in the process of being demolished when this photo was taken. Not long for this world. The Trestle, build in 1928 and modified over the years due to fire and flood damage, still stands. A section of the trestle has already been demolished, visible to the right. 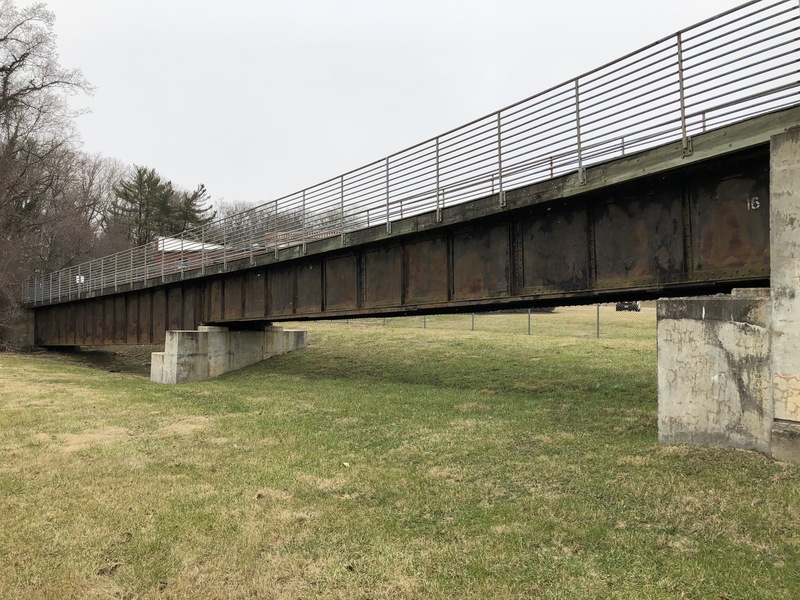 MDOT will be removing the pedestrian deck from the top and then demolishing the rest of the trestle in the near future. While I was taking pictures, I noticed I happened to be standing next to the twisted wreckage of the old escape platform for the East end of the trestle. This small platform is made of steel and timber and closely resembles a standard plan I found in a B&O plans book. Pretty neat! We then hopped in the car and visited Connecticut Ave. The carnage here is massive and I didn’t feel like taking photos or getting out due to the hostile construction zone. MDOT has set up cameras and guards in these areas to protect the NEW equipment they bought, no doubt. (wow!) I can report that the old T.W. Perry property has been gutted and is being leveled. The old bridge just South of T.W. Perry has been completely removed and nothing but a dip in the ground remains. Sad! Our next stop was Bethesda where we drove through town on our way to lunch. Bethesda was very busy and we chose not to stop in the downtown area, as with all the construction it is particularly difficult to get park. There’s not much left to see there, anyway, as it has REALLY become so built up over the last several years. We drove across the Little Falls crossing, then to River Road where we parked and hit McDonalds to refuel. We met a Penn Central hat-wearing railfan there who was dining with family. We shared some stories about the GB and some photos of a PC box car at Conn. Ave. which he enjoyed! We parked at River Road on the South side of the crossing there. We discovered many old remnants of the branch, which was truly exciting! Probably the neatest find was the old Metropolitan Fuel Co. siding tracks which R. Pearlman had shown me photos of from last Fall. The REALLY neat thing is we discovered the old unloading valves and apparatus which still sits in the dirt by the siding. The siding would take loaded tank cars which would be hooked up to the unloading pipes. Valves would be opened, allowing the fuel to gravity-feed down, under the GB track and down hill to tanks below at the fuel depot. 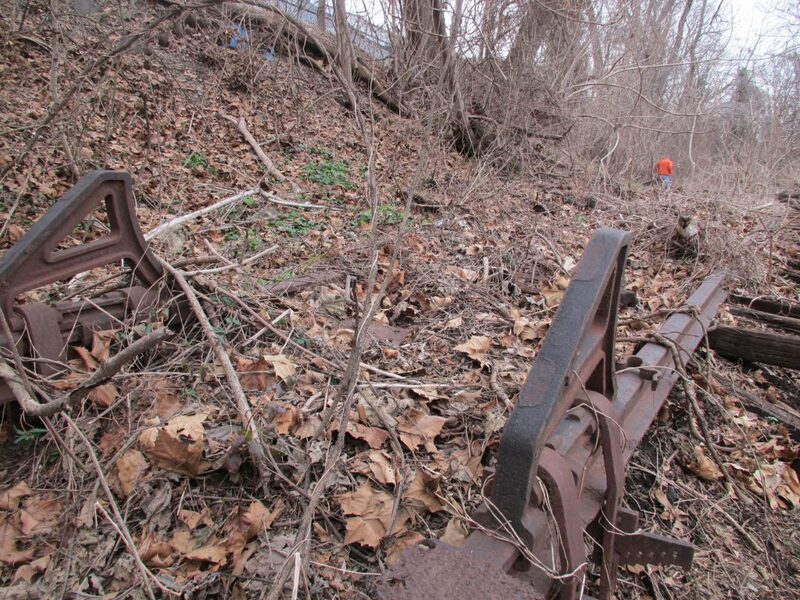 Much of the remains of this operation are still in place, buried in the brush. VERY cool to find and photograph. Who knows how long this relic will be there. I think it’s pretty special! 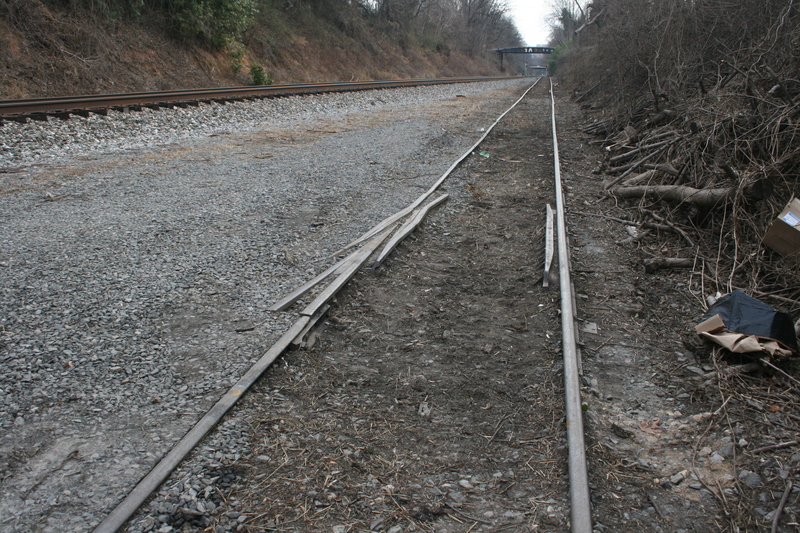 A survivor – this siding, which once served the Metropolitan Fuel Co., is still there. Even the stops at the end of the rails survive! 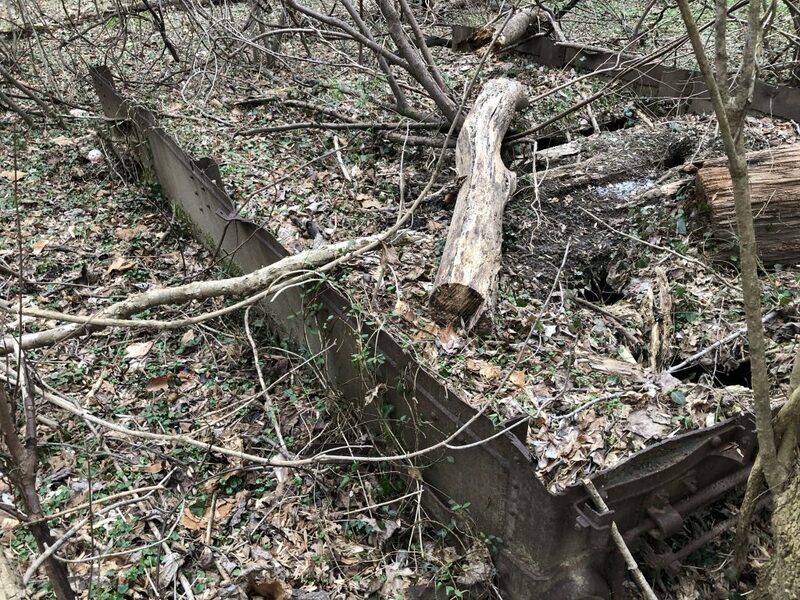 Tank cars were spotted here and unloaded using hoses and pipes which ran down the siding and under the Branch mainline to tanks downhill on the other side of the tracks. 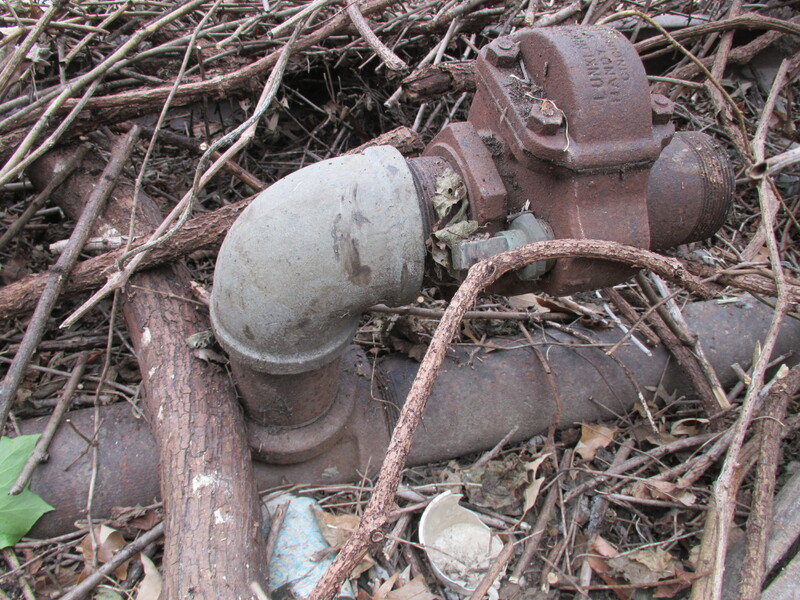 In Bethesda at the Metropolitan Fuel Co siding, one of the valves which was connected to the tank cars survives! In fact, we found two of them still in place, along with all the piping. Really special to find these parts there today! We departed Bethesda, crossed under the Branch at Mass Ave, hooked a Left and followed the Branch through the neighborhoods that back up to the RoW. We arrived at the Dalecarlia Tunnel and hopped out to hike around the area. What fun! First stop was the “bridge over nothing” at the Reservoir. But we all know it’s actually the bridge laid in around 1908 which spans the old stone aqueduct feeder for the Dalecarlia Reservoir, which is just out of view to the left. We then walked down to the Tunnel, which is always a treat. I will have to figure out how I am going to model those large brick abutments! 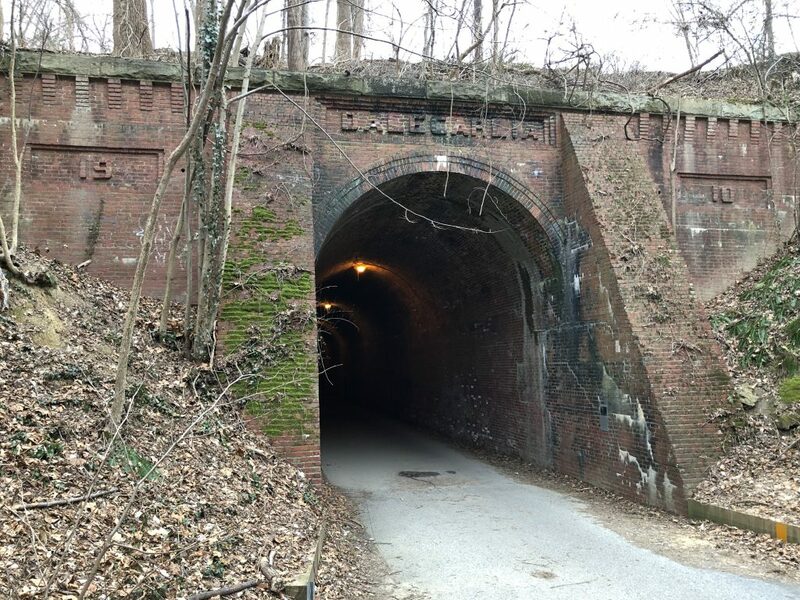 Through the tunnel, past the Army Map siding and at the location where the Capital Traction Co. / DC Transit “Cabin John” branch passed beneath the GB we came to the original bridges, still in place, carrying the Capital Crescent Trail up and over a vehicle access road. 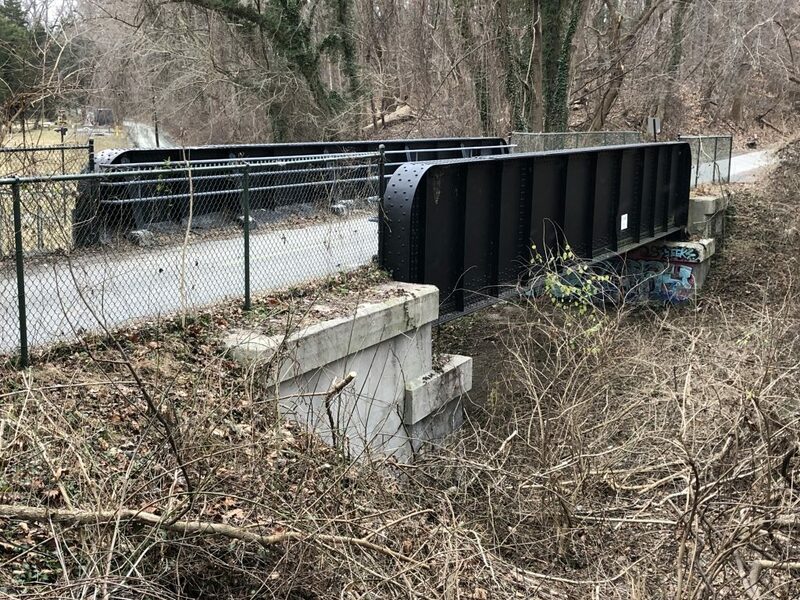 These two bridges once spanned the Capital Traction Co./DC Transit double track Cabin John trolley line and a feeder line for the Dalecarlia Reservoir. 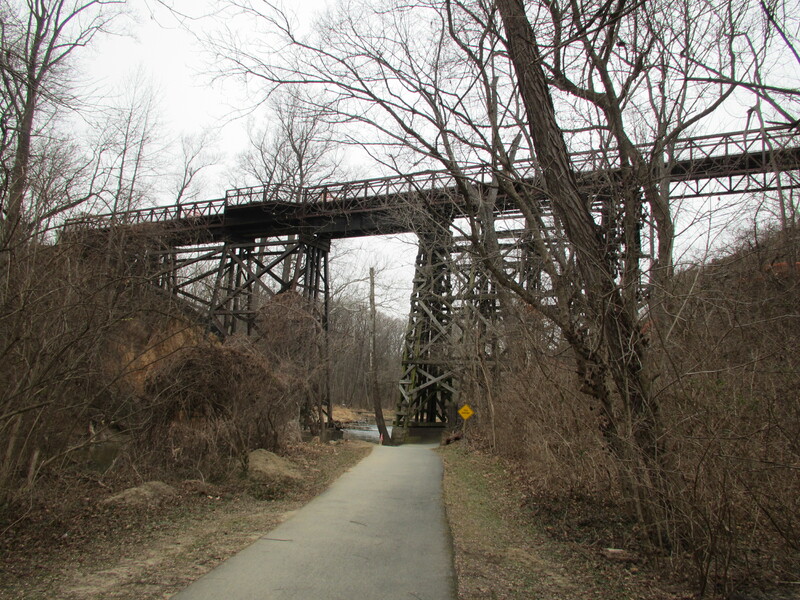 They are still in use today, carrying the Capital Crescent Trail traffic up and over a vehicle access road. They are on a slightly different alignment. The bridge on the left is massive – a good 9-10′ height! The shorter bridge is the one that spanned the DCT trolley line. 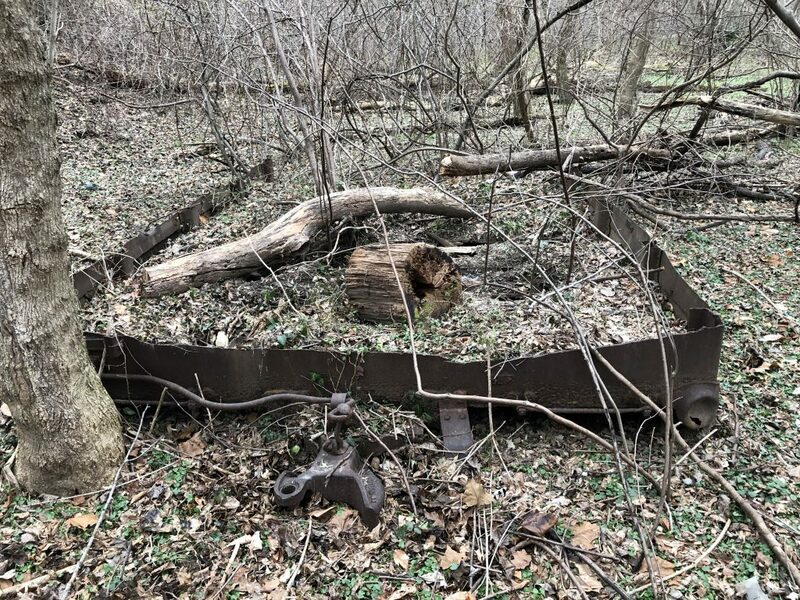 We walked back up to the “bridge over nothing” and I remembered that there were some old freight car remains just about a half mile up the line. So we started walking. 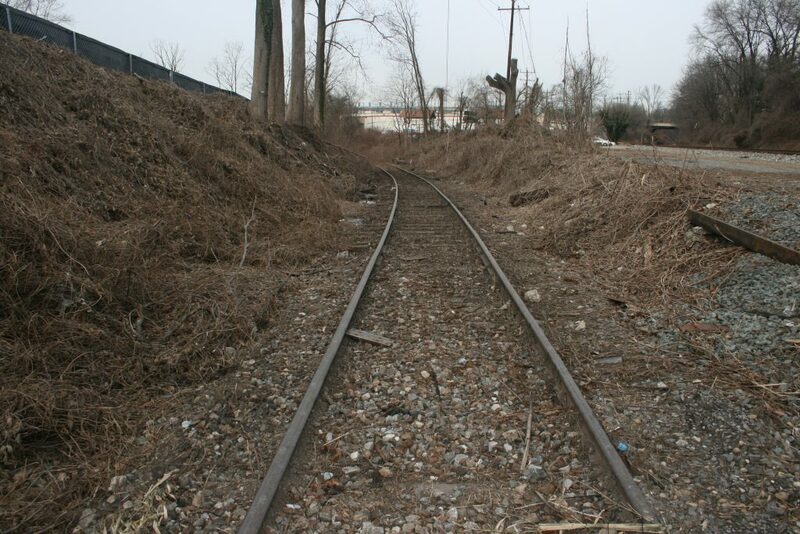 My “abandoned rails” eyes caught something out of the corner… an old right of way! 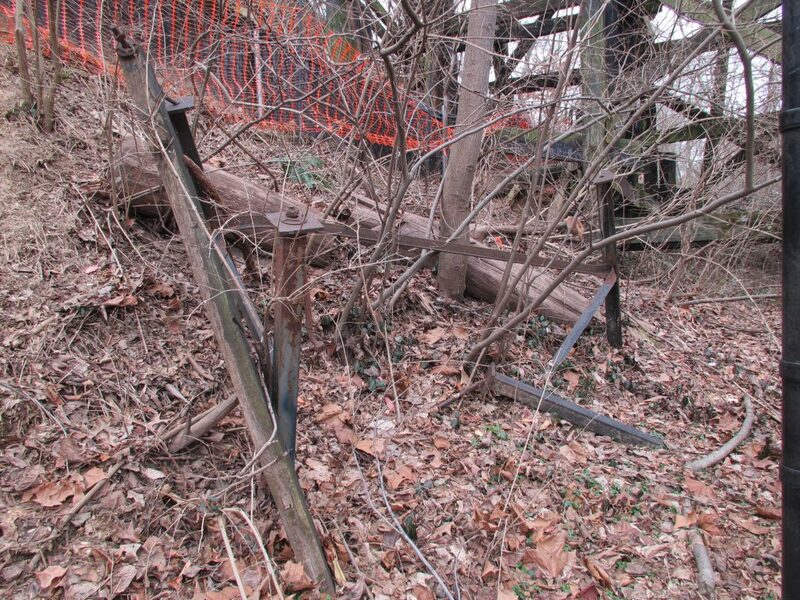 We’re not sure what this was for, but best we can tell it was an old unloading trestle that spanned a small creek. There were remains of abutments, ties and roadbed. There were some concrete blocks and posts in the ground down below, perhaps for pipes or conveyors of some kind. Remember, the Reservoir project was massive and involved lots of concrete for the various ponds. I’m not entirely sure but that’s my best guess! This was probably the coolest thing we found. 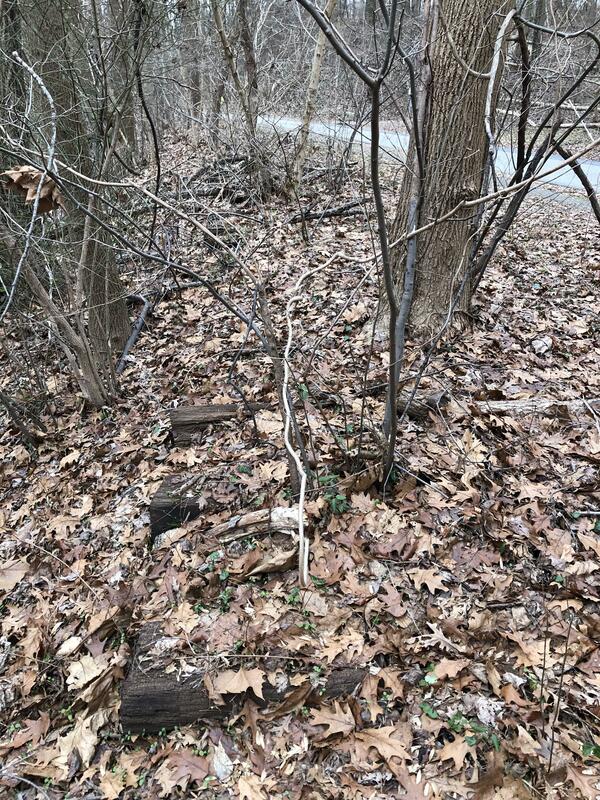 While poking around near the Reservoir, we found the remains of a siding and trestle that I had never seen before, either in person or on maps. The siding was located right next to the Reservoir and appears to be either an old alignment or perhaps a spot for delivering goods to the Reservoir construction project. Mystery! Walking a bit further up the Branch we came to the abandoned box car. This carcass appears to be from a wreck and exists in three pieces. The underframe and two ends. Parts of the couplers and much of the frame are all there. Even decking from the floor are still in place. My best guess is that this car was damaged in a flood down near the River at some point in the 40s. (or maybe earlier) The RR cut the car up, loaded it on a flat car and dumped it for some reason. Not sure why they didn’t just transport the entire thing back to the yard, but maybe someone out there knows. Also, we looked for more cars in the weeds but didn’t find any. This box car was cut up and dumped off the side of the right of way. Best guess is that it was damaged in one of the floods and dumped here after being stripped of useful materials. Hayden, they are. Barely. It’s really neat to see, right? They will be gone soon, as they are right in the path of the Purple Line right of way.